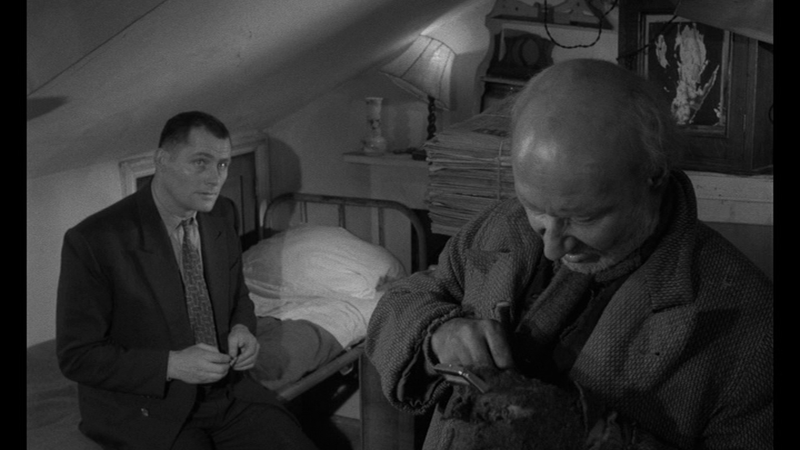 Aston (played by Robert Shaw) invites a homeless man (played by Donald Pleasence) to his home, having him stay the night and away from the snowy weather. The homeless man who says his name is Davies, is not the most pleasing person or most thankful, as he is critical in racist outbursts to only complaining about the draft and the unkept renovation status of the room. But against the outbursts of Davies, Aston keeps calm and quiet. 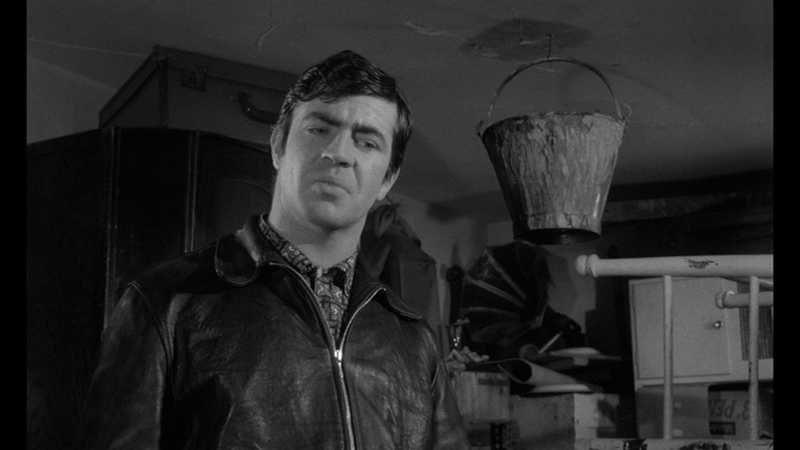 The same cannot be said for Aston's brother Mick (played by Alan Bates) who takes loudly offense to Davies. During the various conversations throughout the time together, the past of the three begin to come forth, as well as their dreams, fears, and madness. 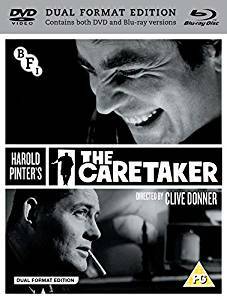 One of playwright Harold Pinter's earliest successes on stage was "The Caretaker", which premiered in 1960 starring Donald Pleasence as Davies, Alan Bates as Mick, and Peter Woodthorpe as Aston. 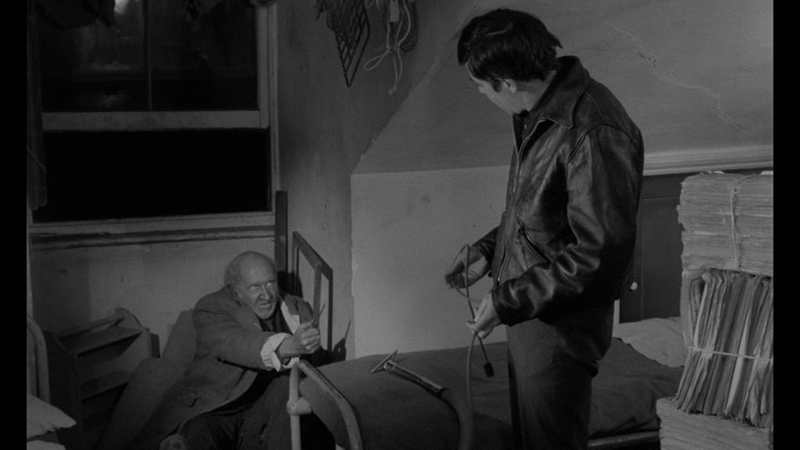 The idea for the story came from a time when Pinter was staying in a flat where he noticed the building owner once bring in a homeless man to stay. The owner was a quiet man who had some mental issues, in which he experienced electro shock treatment in an institution in the past. 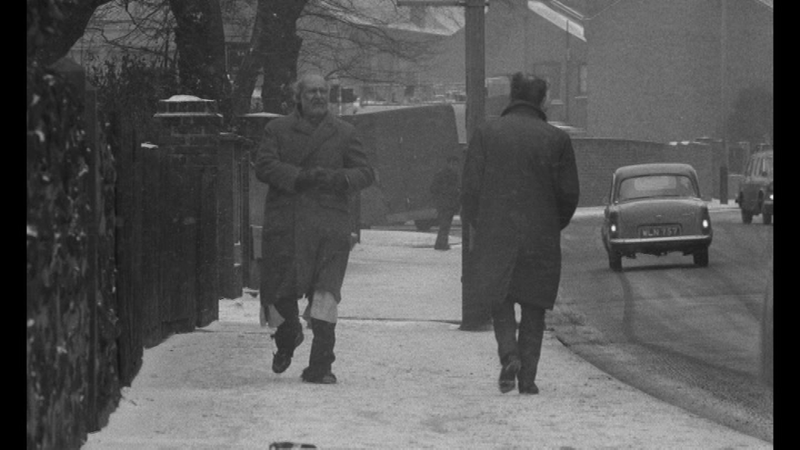 The homeless man stayed for a few weeks, and the strange relationship that Pinter encountered gave fascination into his mind of how the men could have met and struck a relationship that seemed unlikely. Backstories for the characters were created, with each having their strengths and weaknesses. Aston, the building owner is looking to complete the renovation of the building and building a garden shed, yet his mental state is lacking in emotion. Davies, the homeless man is a outspoken and unafraid of consequences, yet he does have a past that he has run from and his paranoia and social status bring him down wherever he goes. In addition to the two, Pinter created a character as the brother of the landlord. Mick is also outspoken and ill tempered, with his distrust in both his brother and the unexpected guest. The combination of the three and the power struggles and difficulties they face come to light in the three act play. Running successfully on stage, adapting the play to a film version came quickly, with film director Clive Donner and producer Michael Birkett looking to make the transition. But things would not come as smoothly. The original financiers from America backed out and no studio seemed interested in making a film about three people that took place almost entirely in one location. Instead they looked at individuals in entertainment that were willing to support the film at £1,000 each, a sort of crowdfunding through celebs. Elizabeth Taylor, Richard Burton, Noël Coward" were a few of the investors who helped with the financing, and it was guaranteed that the main cast and crew would not be paid until a profit came. 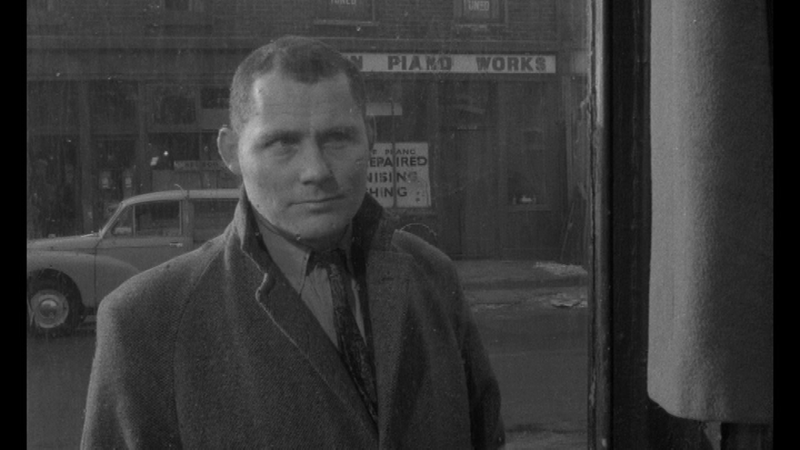 For the screen, Pleasence and Bates would keep their roles while Woodthorpe would be replaced by Robert Shaw. The shooting location would not be at a film studio but at an actual flat, a place that would cost a mere £35 a week and was around the corner from where Pinter once lived. Being an actual housing location there were no removable walls or soundproof rooms, with the cast and crew having to block the scenes accordingly. There were few setups outdoors in the snow, but for most of the runtime it was a combination of the men in a single unrenovated and claustrophobic room. The plot seems quite straightforward but the question was always as to where the story leads. The relationship of the three characters are far and disconnected from each other. Their redeeming qualities seem to shatter with time and revelation. How they start to power play and manipulate each other are not particularly pleasing to the viewers. Critics have for years tried to break down the meaning of the film and the characters. Whether religious, psychological, metaphysical, or testosterone, the exaggeration of the characters during monologues and outbursts are open to interpretation. What is clear is that the language and wordplay by Pinter brings these misfit characters to life and the actors do them justice. Shaw's monologue about his time in the hospital in an extreme long take rivals that of his most famous scene in "Jaws". 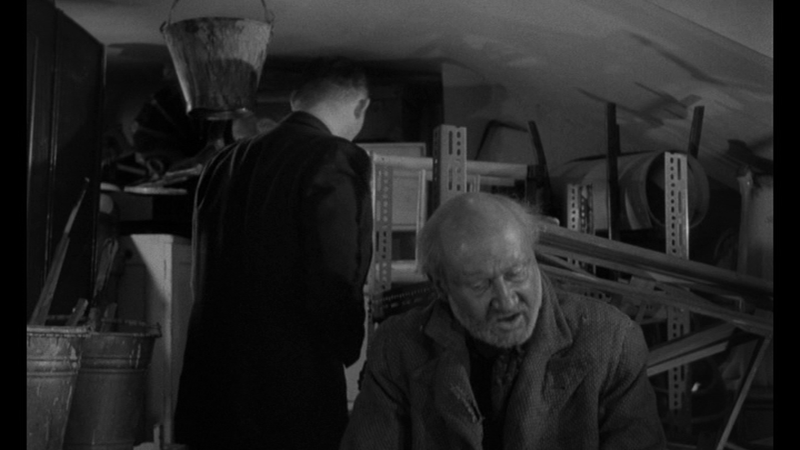 The banter between Bates and Pleasence in their scenes together are intense as they are surprising. Even if each character's personal goal to reach is not feasible within the timeframe, there is something wonderful about seeing the three open their mouths even if it's not what one wants to hear. 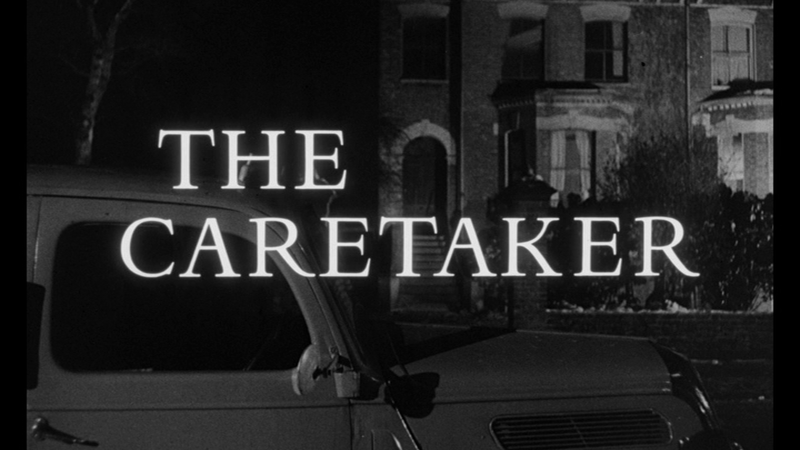 "The Caretaker" won the Silver Bear Award at the Berlin International Film Festival which helped them secure distribution in America where it was retitled "The Guest", and then later theatrically released in the UK with the original title. Even with its limitations in production and appeal, the film was able to find critical success, and was able to make a profit in its original run, and becoming one of Pinter's best known works. The BFI presents the film in the 1.66:1 theatrical aspect ratio in 1080p AVC MPEG-4 on the Blu-ray and in the PAL format on the DVD. For the restoration the original 35mm negative was scanned at 2K resolution by the BFI National Archive with grading completed by Pinewood Studios. The image was cleaned using automated digital restoration tools to remove tears, scratching and negative and positive density dirt. The film stock originally used was heavy in grain structure and thankfully that has been left intact while removing other forms of damage. 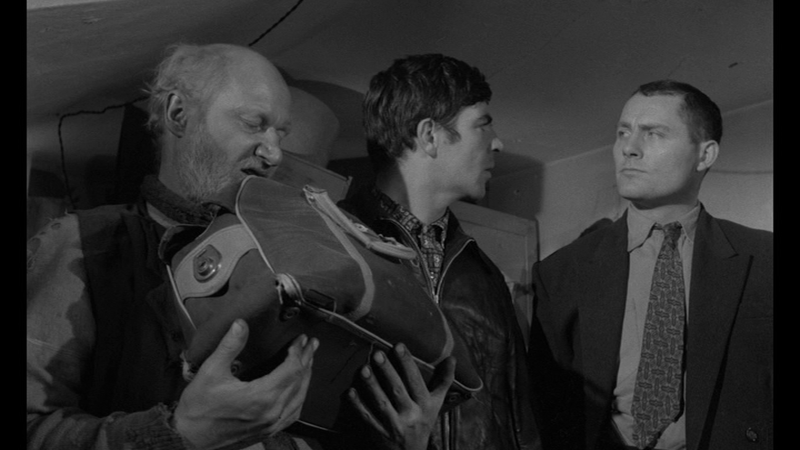 The black and white photography shot by famed cinematographer Nicolas Roeg looks crisp and clean, with a well balanced look in the grey scale. Minor damage is still visible on certain scenes but nothing to distract the viewing. The runtime for the film is 105:16 on the Blu-ray and 100:57 on the DVD accounting for 4% PAL speedup. The original mono track is uncompressed on the Blu-ray and a standard Dolby Digital track on the DVD. The sound was transferred and remastered from the original 35mm mono track negative by the BFI National Archive. Like the image, the sound has been cleaned leaving a well balanced track, though note that the original production in a non-studio set had its limitations. Thankfully voices come in clear and there are no issues of hisses or pops in the soundtrack. There are optional English HoH subtitles in a white font for the film on both discs. In this audio commentary by the director, the producer, and the actor, the three have a roundtable discussion about the production. Discussed are the process of how the play was adapted to film, the financing difficulties, securing the location, the motivations of the characters, the performances, the film stock used, and more. The three are very talkative for the first hour, but for the rest of the runtime they start to run out of steam, with a few empty patches in the track. This commentary was previously available on the BFI 2002 DVD edition. Critic Michael Billington hosts this featurette in which he talks about how Pinter's real experience led to the creation of the play, information on the characters, changes between the play and the film and more. Although it is labeled an "introduction" there are a lot of spoilers in this featurette and is advised to be seen after the film rather than before, though note the only way to access this extra is to select "Play Film" and choose to watch it with (or without) the introduction. It is not accessible through the extras menu. Note this extra was oreviously available on the BFI 2002 DVD edition. In this vintage television piece, there are some behind the scenes footage of the film shoot, footage of Pleasance's make-up being applied, and a short interview with Pinter. Note this extra was oreviously available on the BFI 2002 DVD edition. In this visual essay by Michael Billington, it features the differences the story went through in its adaptation for screen. There are original notes by Pinter shown, deleted sequences including a scene at a cafe, the importance of the outdoor scenes and more. In addition he discusses about the financing for the shoot, the production costs, and the difficulty it had for screenings theatrically. Note this extra was oreviously available on the BFI 2002 DVD edition. Retitled as “The Guest” for the American market. Five animated shorts were made for the series "Pinter People", and this one featuring two men drinking coffee and having a discussion was the last of the series. 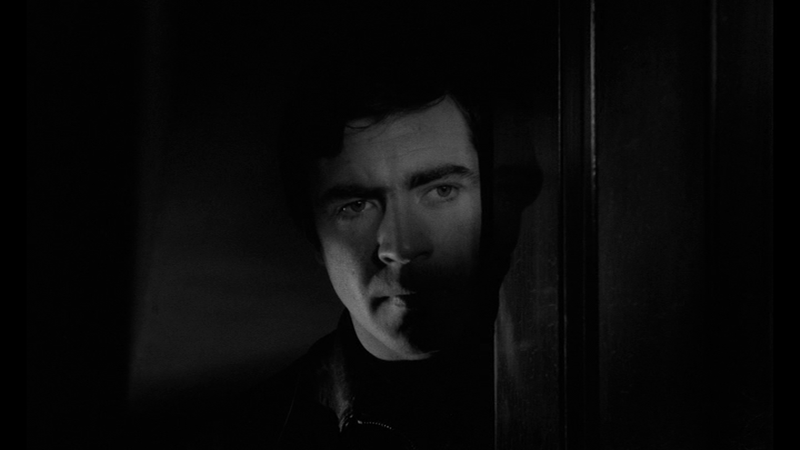 The other four in the series can be found on the DVD set "Pinter at the BBC" released earlier this year from the BFI. In this television interview, presenter Ian Cameron talks to Donner about the film and the original play, a full ten years after the making. Discussed are the adaptation to screen, the meanings and interpretations of the characters, critical reaction, the lengthy monologue sequence, and much more. A manual slideshow of 32 black and white stills from the set. All the extras are repeated, all in standard definition PAL. Enclosed is a 24 page booklet with essays, stills, and more. The first essay is by film journalist and author Amy Simmons who discusses the story and the characters. Next is a short essay by Michael Billington on the film, which was originally printed in the booklet for the DVD edition. 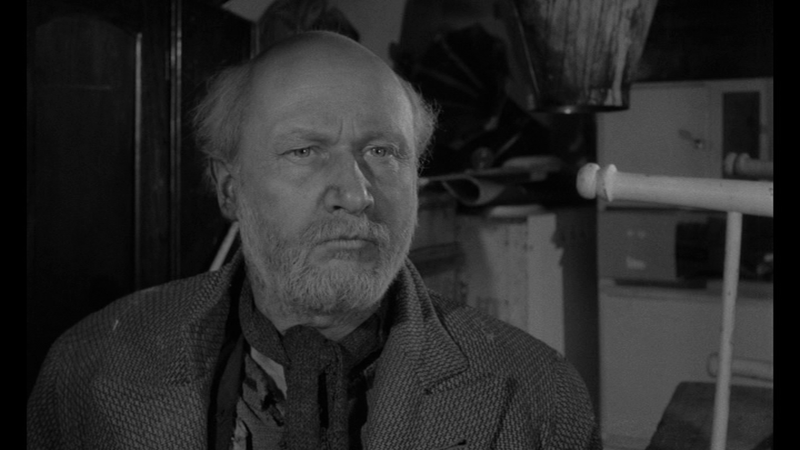 Next is a tribute to Donald Pleasance written by Clive Donner in 1995 after Pleasance's death. A written biography for Donner follows, along with film credits, special features credits, and acknowledgements. All the extras from the previously released 2002 DVD are carried over except for the biography notes on Donner and Pleasance, though they are available in the booklet by Donner's tribute to Pleasance and the printed biography of Donner. Also note the 2002 DVD had the film in an open-matte 1.33:1 aspect ratio while the new dual format set has the film in the theatrical aspect ratio. Extras on this new set are great, though there are many times that the information is repeated on differing extras, and unfortunately the only input from Pinter himself is in a very short interview. It would have been great to hear his voice on the play and the film through vintage interviews. "The Caretaker" is an example of bare essentials - three characters, one setting, and with Pinter's words it brings life with unexpected twists. The BFI dual format set includes a great transfer and a great extras making this set recommended.